The innovative website, Longevitypuzzles.com combines creative content with reader participation. The overwhelming 70,000 (update) impressions were largely generated by a PRWeb press release announcing the opening. To clarify best, the following is an example of a future fictionalized episode containing the clues for the solving of the crossword and word search puzzles. It is unlikely that one person in 10,000 would be able solve the Crossword Puzzle without first reading the short text. The clues are there! A case in point is the strange fragapane phobia (fear of birthdays) of Mr. Expectations, which he experienced later in life. In effect, he refuses to recognize his birthday in a dour (far from cheerful) and taciturn (not talkative) demeanor. The reason is that he is unwilling to celebrate his natal (pertaining to birth) day is because it reminds him that his remaining days are numbered. Furthermore, he doesn't want anyone including family and friends to acknowledge or celebrate his birthday. To escape an approaching birthday, for example, he went on a pleasure cruise to Thailand. The ship's staff inadvertently announced the occasion of his birthday at supper. The birthday cake, candles et al were subsequently jettisoned (dropped from a boat) into the Pacific Ocean. Be that as it may, there is no paucity (scarcity) of intellect here. For example, he has a huge vocabulary from which to draw. He did his homework, and read on the internet about the secrets of the new centenarians. For instance, a woman who credited her 100 years to a love of rasher (bacon) and other centenarian desultory (eccentric) behavior. He became fascinated by cemetery grave stones, particularly those of the centenarians. He located them with a necrology (list of the dead) of those buried in the cemetery which he obtained at the office. 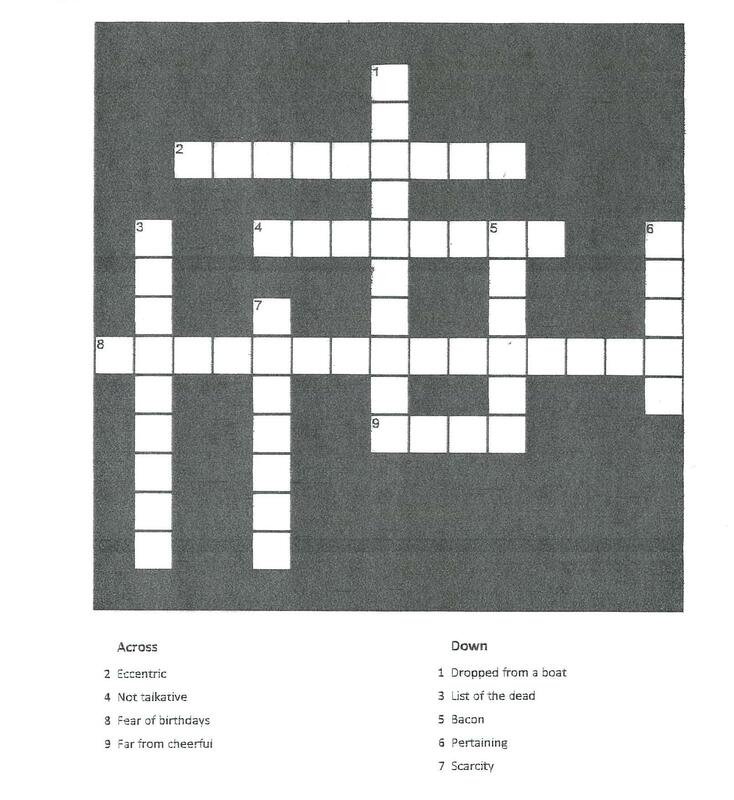 Now at this point the readers of the short text above reinforce their newly found 'Word Power' by solving the longevitypuzzles.com such as the one provided here (See attached). So, instead of relying on just rote thinking, think like a detective. Search the provided text for clues to the puzzle. Allow the Word Power to provoke new thought-filled ideas and solutions to your life. Challenge your mind to think out of the box. Each week the text and the puzzles are changed. Each week the reader's word vocabulary grows . . . painlessly and naturally. Don Abrams is a retired twenty-five year Professor at Algonquin College of Applied Arts and Technology (Ottawa, Ontario, Canada). Based on a previous international best-seller, The Profit Taker, he has conducted more than 100 seminars at leading universities and colleges in Canada, the U.S. and China.